You can definitely tell Fall is coming around here. The beds are slowly starting to get cleared out. Squash plants are dying back. The tomatillos are harvested and pulled out. Kale and lettuce are done. That opens up one entire bed for fall planting. The dry beans are done and will also be pulled out this weekend. The bed that had our peas in it is also open. It’s a bit of a relief because I was worried that we wouldn’t have enough space for our fall crops, but I think we’ll be OK. This weekend will be all about prepping and planting. As beds get cleared we’ll be putting down rabbit and composted livestock manure to dig in. 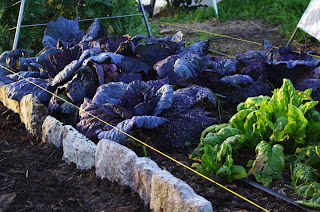 Then we’ll be planting kohlrabi, cabbage, Brussels sprouts, cauliflower, lettuce, spinach, beets, carrots, and kale. I planted some of my Fall garden a few weeks ago, but the weather is still so darned hot that not only did ZERO lettuce or spinach come up, but my snap peas are starting to wilt! Crummy summer harvest followed by crummy fall harvest. Does it EVER end?? Good luck on your fall planting! Linked to your post yesterday about the Cornish chickens. I wish you were close and would come do the same for my garden. Maybe you need an Appalachian (working) vacation?